Remove the stems from the shiitake, if you are using whole shiitake and discard, saving the soaking water. Slice the caps thin and place in a saucepan with the maple syrup. Measure the shiitake soaking water in a measuring cup. Add fresh water, if needed, to equal 1 cup of liquid and pour it over the shiitake. Bring to a boil, cover, reduce the flame and simmer for 10 minutes. Remove from the flame and allow to cool to room temperature. 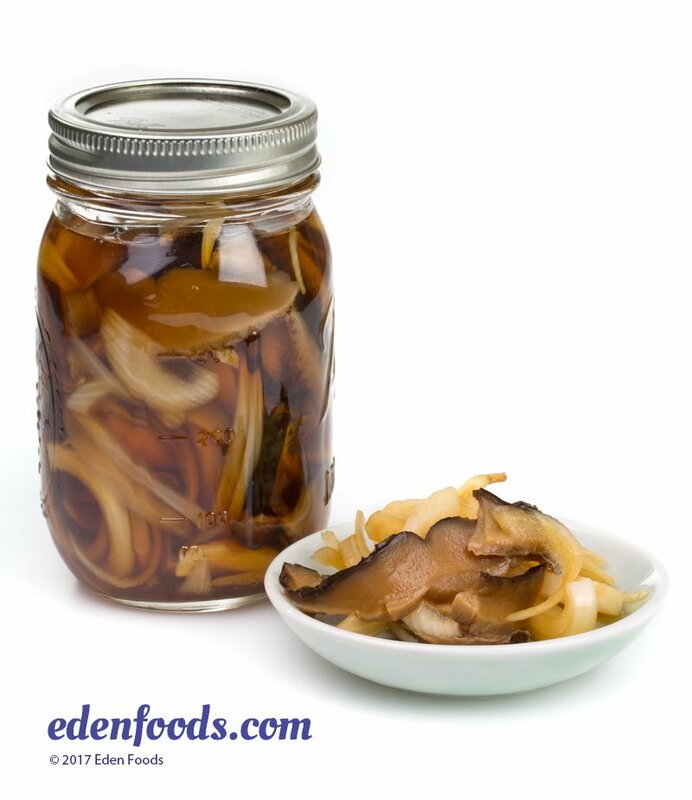 Place the onions in a one quart glass jar and add the vinegar. Pour the shiitake and cooking water over the onions. Place a piece of clean, cotton cheesecloth over the mouth of the jar and tie to secure with a piece of string or a rubber band. Place on the counter and let sit over night (24 hours). Remove the cheesecloth and place the lid on the jar. Refrigerate and remove as needed during the week, always keeping the remainder refrigerated. Generally, 1 tablespoon per person is the recommended serving, several times per week. Always rinse the pickles that you remove from the jar under cold water to remove excess salt before serving. These will keep approximately 10 days, refrigerated. Homemade, non-pastuerized pickles are an excellent source beneficial lactic acid, vitamins, minerals and other beneficial bacteria that help aid in digestion of foods we eat and to maintain a healthy digestive system.